A work by Antonio Nunziante. UNIQ Expo in Istanbul is hosting Antonio Nunziante's works in "Penser l'image et Peindre La Pensee" ("Think the Image and Paint the Thought") simultaneously with the Joan Miro Lithograph and Gravure exhibition until Dec. 2. The most specific function of the exhibition, which includes metaphysical works, is that Nunziante deepens the artistic approaches of outstanding figures with extraordinary competence in his technique and pushes the limits with the imaginary universes he shaped. While the pieces promise visitors a journey to the subconscious and promote artistic mystery thanks to poetry, they present a new image of solitude, which lends an ear to the silence of the world. It can be said that, in general, the pieces shine with the harmony of perfection and pure beauty while conveying the message that the only route to invisibility is possible with poetry. 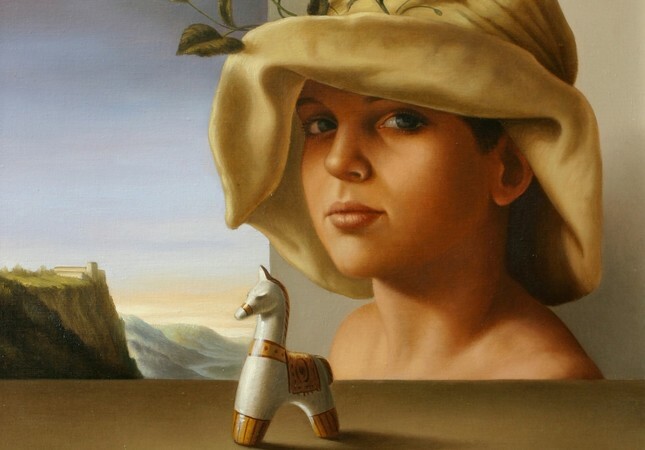 Born in Naples in 1956, Antonio Nunziante started exploring oil painting at the age of 8. He moved to the U.S. in 1991 and worked at Artexpo in New York and Los Angeles. In 1990, Tokyo hosted his personal exhibition. He also held personal exhibitions in New York (1991) and Florence (1992). At "Il Valore della Figura," which is accepted as the most prominent retrospective exhibition of Italian painting, Nunziante is shown among artists such as Bueno, Cascella, De Chirico, Guttuso, Modigliani, Morandi, Marino Marini, Severini and Sironi. He welcomed 2001 with his work titled "Dimensions Paralleles" ("Parallel Dimensions") which was exhibited next to the works of Salvador Dali and Max Ernst at the exhibition "Hommage a l'ile des morts" ("Homage to the Isle of the Dead") held at The Bossuet Museum in Paris. The artist achieved widespread success in the 2000s and has won many awards. He has held exhibitions in New York, Philadelphia, London, Paris, Miami and Prague. With his two prominent works, he left his biggest mark on 2013. His oil paintings entitled "Projet pour un voyage encore possible" ("Project for a voyage still possible") and "Atelier sul mare" sold for record prices, $62,500 and $68,750, in New York and at Sotheby's. Oud Sint-Jan Museum in Belgium held the "Picasso-Nunziante" exhibition on June 27, 2016. Curated by Jean-Christophe, the exhibition was formerly held at Pall Mall Gallery in London.